I was reading an article on Dr. Cornelius Hunter’s blog the other day, and he mentioned a 2009 study of which I was not aware. I was surprised by what Dr. Hunter wrote, so I read the study myself and became even more surprised. Quite frankly, I nearly fell off my chair. I try to stay relatively informed on major advances in the sciences, but somehow, I missed this one entirely. Even when not part of a multicellular creature, cells in groups often communicate with one another. When bacteria group together in a colony, for example, they communicate with one another so that they can do things like forage for food as a group and form coherent structures such as biofilms.2 Once again, however, most of the research that has been done on how this communication takes place focuses on chemicals that the cells release into their environment. The study to which Dr. Hunter referred looked at an entirely different means of cell-to-cell communication, and if its conclusions are correct, the method is nothing short of amazing. 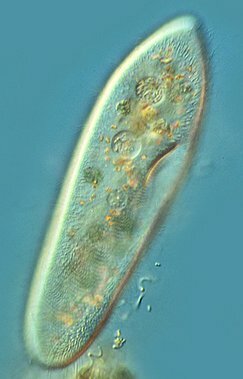 Dr. Daniel Fels decided to see if single-celled organisms of the species Paramecium caudatum (pictured above) could communicate with one another by some means other than releasing chemicals. He put a colony of the organisms in a small cuvette (a straight-sided glass or quartz container) and another colony into a larger cuvette. He then nested the smaller cuvette into the larger one. As a result, the two colonies were close to one another, but from a chemical standpoint, they were pretty much isolated. Any chemicals released by one colony could not get through the cuvette to the other colony. He then put the cuvettes in complete darkness to see if the two colonies could affect each other in any way. He also varied the number of organisms in each colony, to see if that would produce any effect. …depended significantly on (i) the presence or absence of a neighbouring population, (ii) the number of cells in the neighbouring population and (iii) the material (glass or quartz) separating these populations. So it really does seem like the organisms in one population affected the other population, even though there was no way to transfer chemicals between them. How does Dr. Fels interpret these results? He thinks that the organisms are communicating with one another using light! He says that’s why the material of the cuvettes was important. Glass and quartz transmit different frequencies of light, so the composition of the cuvettes would be important if the communication was being done with light. Is this definitive proof that the organisms were communicating with light? Of course not. However, it is the most likely explanation for the results. In addition, low-level light has been detected coming from other microorganisms4, animal tissues5, and plant tissues.6 Communication using light would at least explain why cells emit it in the first place. In addition, a talk given at a recent scientific conference indicates that the patterns of light emitted by cells have the characteristics of binary data that are being sent over a noisy channel. Obviously, a lot more work has to be done on all of this, but if it turns out that cells really do communicate using light, it is just another example of how complex life really is. Even at the cellular level (which is supposed to be relatively simple), it still holds many surprises for us. The more I learn about life, the more I stand in awe of its Creator. 4. Mei W-P, “Ultraweak Photon Emission from Synchronized Yeast (Saccharomyces cerevisiae) as a Function of the Cell Division Cycle,” In: Recent Advances in BIOPHOTON RESEARCH and its Applications, Popp FA, Li KH, Gu Q, eds, World Scientific 1992, pp. 243–258. 6. Strehler BL, Arnold W, “Light production by green plants,” Journal of General Physiology 34:809–820, 1951. This opens the door for all sorts of studies in biology. Maybe, many years down the road of course, we will be able to treat some types of disease non-invasively by using some kind of “light” treatment. It seems microbiology is more complex than ever! I noticed in their article they didn’t even attempt to explain how this process evolved much less work. It seems evolutionists are going to have lots of trouble dodging this one. Really fascinating article, thanks for sharing! It is very exciting, Seth, and it will be interesting to see what kind of stories evolutionists spin to explain this! So we could even be able to communicate with microorganisms in the future? That is so cool! Dr. Doolittle would approve. How interesting. Had to read this to my husband! That would be cool. Just bathe someone’s body in “not enough food; stop multiplying” light signals.